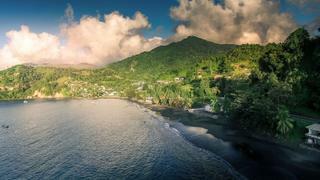 The view across Marigot Bay in St Lucia. Picture courtesy of Shutterstock.com / ATGImages. 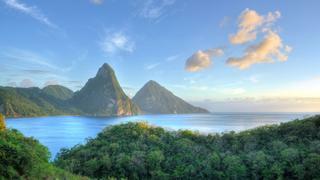 The Pitons of Saint Lucia, Caribbean. Picture courtesy of Shutterstock.com / PlusONE. Cumberland Bay in St Vincent and the Grenadines. Picture courtesy of Shutterstock.com / Larwin. 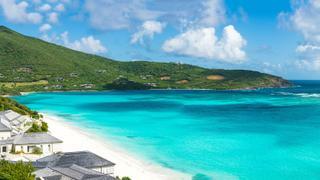 Canouan Island. Picture courtesy of Shutterstock.com / Jason Audain. The Tobago Cays. Picture courtesy of Shutterstock.com / Larwin. 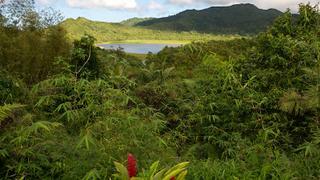 Grand Etang National Park on Grenada Island. Picture courtesy of Shutterstock.com / Claudio306. With landscapes clothed in dense rainforest and waters teeming with a rainbow of fish and gigantic green turtles, the chain of islands that makes up the Lesser Antilles offers some of the best cruising in the Caribbean for those seeking the solitude of nature. Allan Rayner, former skipper _on board_ Lady J, which is available to charter with Churchill Yacht Partners, reveals a relaxed route encompassing St Lucia’s major landmarks, the unspoiled beauty of the Grenadines and the buzz of the spice island of Grenada. 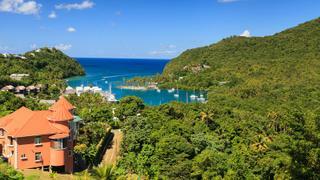 Arrive at the naturally sheltered marina in Marigot Bay. This is via helicopter shuttle from Hewanorra International Airport to George F L Charles Airport, followed by a short taxi transfer. Enjoy a champagne reception on arrival on board Lady J before departing for a one hour sunset cruise to Rodney Bay and supper on board. Cruise in the early morning to the Pitons; the scenic route past St Lucia’s lush mountainous shoreline will take roughly two hours. Have lunch on the Celestial Terrace at Jade Mountain Resort. Here you can enjoy freshly caught snapper or swordfish served with vegetables grown on the estate, while gazing across at the towering peaks of the Pitons. Divers can check out the Superman’s Flight site, at the base of Petit Piton, for moray eels, seahorses and vivid coral. Cruise overnight to St Vincentand wake up in Cumberland Bay, where you can dive and snorkel directly off Lady J. For film fans the next bay down, Wallilabou, was used as a set for Pirates of the Caribbean and is worth a quick stop off. On shore, the beautiful 18 metre Dark View Falls are a short taxi ride away. Wake up in Salt Whistle Bay, Mayreau, where two pristine half-moon beaches face each other. Enjoy a day of watersports off the beach followed by sundowners. After an active day indulge in a seven course food and wine pairing experience on Lady J. 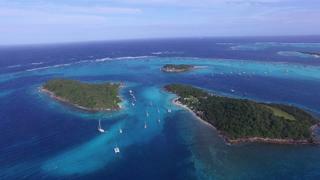 As the sun rises Lady J will wend her way down to Canouan and anchor in the crystal-clear waters of Charlestown Bay. Golfers can play 18 holes at the Pink Sands Club Golf Course, designed by Jim Fazio. It is considered one of the top courses in the Caribbean. Afterwards, Tamarind Beach Resort is a relaxed lunch spot; guests can relax with their toes in the sand while enjoying freshly cooked pizzas. 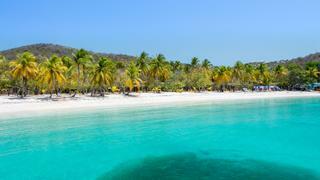 Spend the day in Tobago Cays, where the crew will set up furniture on the beach on the island of Petit Rameau. 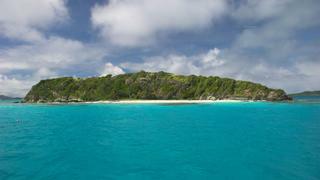 The Tobago Cays Marine Park encompasses the five cays and is a protected turtle feeding ground. You can get up close and swim with the turtles, or take a paddleboard and watch them glide effortlessly underneath you. Make the journey overnight to Grenada and moor in the chic Port Louis Marina. If possible, extend your trip and enjoy bartering at St George’s Market, held on Saturdays, or explore the tropical rainforests of Grand Etang National Park. When you’ve had your fill of the island, depart from Maurice Bishop International Airport. Hero picture courtesy of Shutterstock.com / Steve Smith.